So good, it’s worth fighting over! Let us know how we can help you! Because one of our goals for Feed Bandit is to help link hunter and feed producer we welcome the opportunity to help companies in the feed industry do just that with our product reviews. So when Double Tine Innovations came calling we were ready to put their Ultimate Deer Feed to the test! Right off the bat I was impressed with the logo and packaging of Double Tine Innovations’ Ultimate Deer Feed. Very sturdy and right to the point. When I first opened the bag of my initial thought was, “Wow! I need a bowl, spoon and milk; this smell is taking me back to my cereal eating days when I was a kid!” The aroma was incredible and I instantly knew this mix would be a hit with the deer, especially I thought with the axis deer. My countless hours of Internet research have led me to the following conclusion: no axis deer heard is the same in the Texas. I’ve heard of axis deer in the hill country that will feed on deer corn and deer protein. Other herds, will only eat alfalfa while other’s eat cattle cubes. But if there is a common denominator it seems as though all axis deer have a sweet tooth! This being said, the axis deer on Rancho Bandido do not typically eat at our deer corn feeders and will only occasionally eat deer protein out of our free choice feeders, so I was very curious to see how they liked the sweet aroma of Double Tine Innovations’ Ultimate Deer Feed. I was very impressed by the diversity of feed choices in this blend. The cracked corn, roasted soybeans, protein pellet and oats offers a smorgasbord of nutrition-packed goodies. 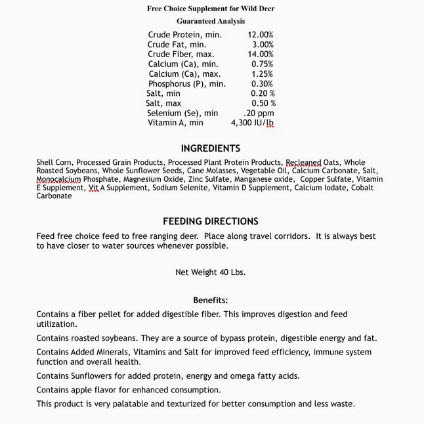 Individually, I knew these feed choices were very effective by themselves so I was excited to see the results as a blend. My only question was the sunflower seeds. I did not have any experience or first hand knowledge of sunflower seeds as a food source or attractant for deer so this test has opened up my eyes to yet another feed source for attracting animals. Our goal was to test Double Tine Innovations’ Ultimate Deer Feed for a week and in two locations known to have fair to good amount of animal traffic. The first location is near a constant water source (spring fed creek) and is always a high traffic area for our whitetail deer and exotic species as well. We placed the feed into a feed barrel and filled it to the top. We then set the feed barrel out in an open area but near cover. We did not spread the product around as I wanted to test the attractiveness of the product’s aroma…I would not be disappointed. It took a day or so, but our first visitors were was a small heard of black buck antelope. Some whitetail deer stopped by although the camera shots around the feed barrel were a bit out of focus perhaps because it was closer to dusk? It didn’t long for the axis deer to discover the feed though. At this particular location, the axis deer visited the barrel the most out of all the other animals. So it seems that Double Tine Innovations’ Ultimate Deer Feed is so good it’s worth fighting over! Young Black Buck vs. Squirrel…Squirrel wins! Over the course of a week at this location we captured over 100 pictures. Every species known to frequent this part of the ranch was present but as I stated earlier, the axis deer seemed to be the most frequent visitor which I found to be very surprising given our axis deer very rarely frequent our deer protein feeders and never touch the corn feeders. That is certainly a testament to the attractant ability of the Ultimate Deer Feed. Location #2 on Rancho Bandido is a bit more remote than location #2 and is located near one of our high traffic protein stations. We were interested in the “stopping power” of Double Tine Innovations’ Ultimate Deer Feed. In other words, would deer stop and feed en route to a known feed source? Also, I did not put the feed in a barrel. I simply spread out an entire bag out in a line to help attract more animals coming into the protein feeding station. When I first checked this trail camera at the end of the week I was disappointed because I had around 75 pictures and most appeared to show no animals in view. My disappointment was quickly turned around when I discovered that the feed had been wiped up by groups of whitetail deer and in and a very short period of time! The images below are two of the best group shots. This particular pasture is heavily managed for whitetail deer, black buck antelope, axis deer and the various other bird species. Feral hogs are harvested with out question and seeing them on this particular pasture is rare. Guess what showed up? Was it the aroma of the Double Tine Innovations’ Ultimate Deer Feed that lured him in? When we started our test we asked the question, is Double Tine Innovations’ Ultimate Deer Feed an effective feed at attracting the animals that roam the great State of Texas? Well there is no doubt that the Feed Bandit test is a resounding YES! Further we have no doubt that Double Tine Innovations’ Ultimate Deer Feed will be a success no matter where in this great country you use it. If the picky animals at Rancho Bandido enjoyed it it will be enjoyed everywhere for sure! We would like to thank the fine folks at Double Tine Innovations for allowing us to test their stellar products and we are looking forward to testing more of them in the near future. Pick up some Double Tine Innovations’ Ultimate Deer Feed at your favorite feed supplier and if they don’t have it, ask for it! The Feed Bandit ranch, Rancho Bandido, is an outstanding place to test various wild game feed types on not only native Texas animals such as the whitetail deer and Rio Grande turkey but also on exotic game such as the black buck antelope and axis deer. If you’d like us to review your product, let us know!